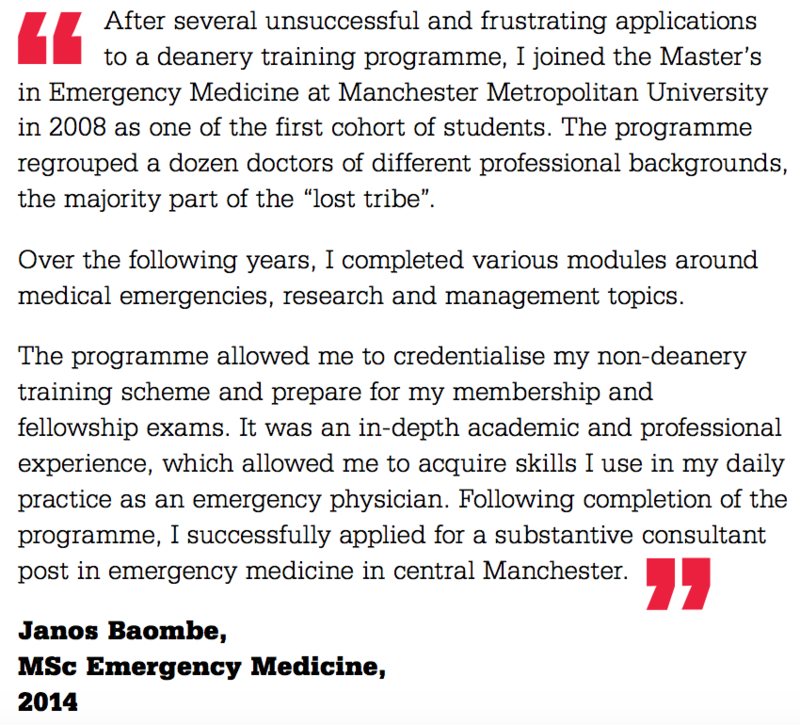 My apologies in advance for a bit of advertising about the MSc in Emergency medicine that we run here in Manchester. 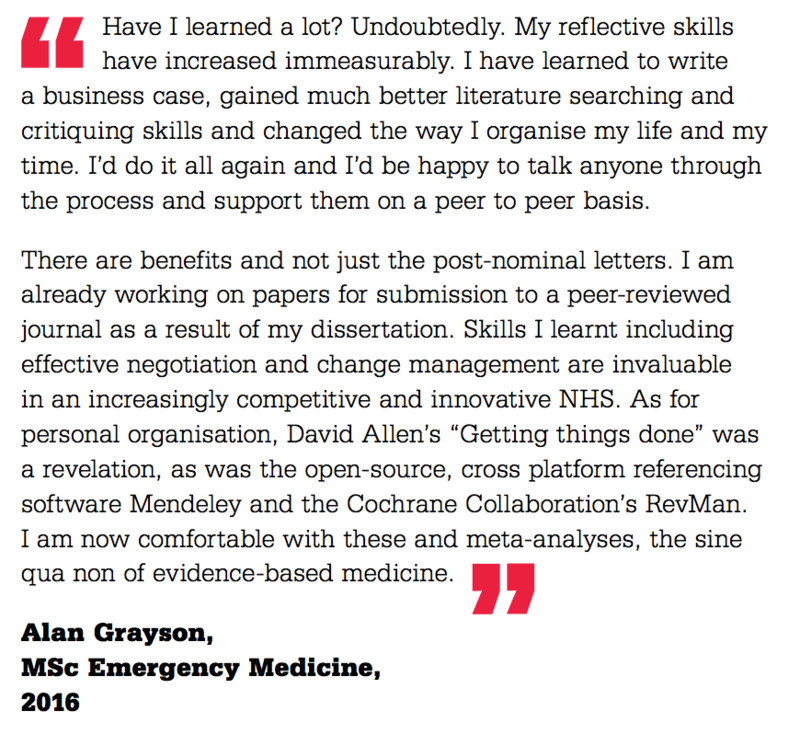 The program was the first MSc in EM in the UK (pretty sure about this) and has been a great success with some amazing graduates like Natalie May, Alan Grayson, Janos Baombe and others who are still in the St.Emlyn’s team. What’s the point of doing an MSc? I totally appreciate that there are many, many things that you can do whilst training. In EM I personally think that we have suffered from too many exams over the period of training and I’m also an advocate of having a balance to life and not taking too many things on (Ed – must follow own advice), but there are advantages to getting additional qualifications. Firstly, you’ll learn something new and that’s great. An MSc covers much of the same material as EM training and will therefore cross over into the FRCEM exams. Completing the modules is a way of keeping on track and up to speed at a higher level of learning. We’ve always argued that as an EM trainee there is an expectation and requirement to keep up to date, to learn new things, to create new knowledge and to maintain an enthusiasm for the speciality. Most if not all trainees have to do this and yet they get little formal recognition for all that incredible work until they complete their college exams. Completing an MSc/Dip/PGC is a way of getting even more recognition of what you do, and it will make you stand out from those without a higher degree. Remember that MB.ChB is not a higher degree, and the title Dr. is considered honorary. 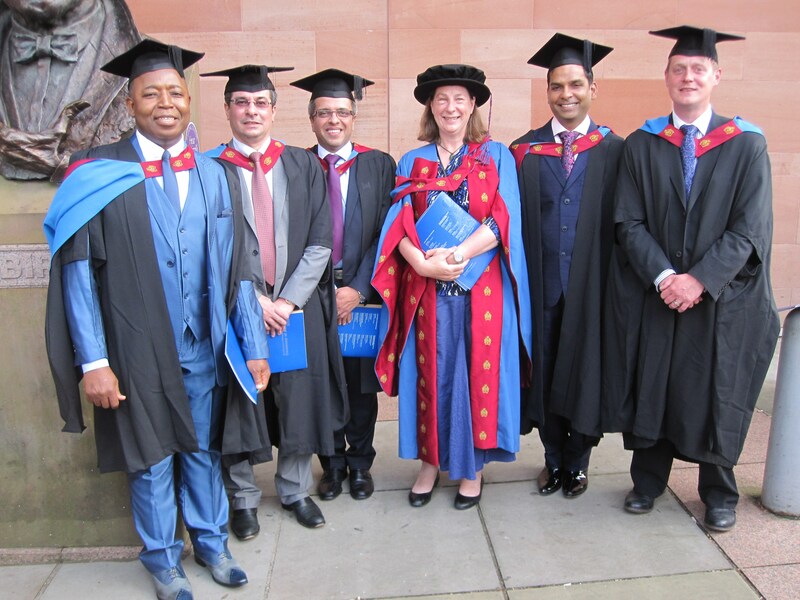 Getting a higher degree is increasingly important in consultant life. I’m not sure that’s a good thing, but it is a thing (go check out the job specs of higher level consultant jobs if you don’t believe me and have a look in the desirable column). I think many of my nursing colleagues recognise this well (better than most docs) and are leading the way with higher qualifications (and that’s a reason why this course is multiprofessional too). MSc work is pitched at a higher level than a lot of training. It’s not enough to simply know stuff, but rather masters level students need to be able demonstrate that they can evaluate, analyse and create knowledge (moving up Bloom’s taxonomy in other words). Those skills are generic and will carry people through their career. This is not something we’ve just talked about either. Many of the St.Emlyn’s team have completed the course and/or are teaching on it. We all believe that developing higher qualifications is a great thing (I’m doing a PhD with MMU at the moment). The bottom line is that we don’t just think it’s good for others, we too have lived this learning journey. The MSc Emergency Medicine is available to students on either a full or part time basis and consists of two phases of study; successful completion of 60 credits at Phase 1 allows students to exit with a PgCert, whilst successful completion of 120 credits will allow students to exit with a PgDip. Students can elect to undertake particular named routes through the programme or undertake a generic programme of study by electing 60 credits of study and focusing their Phase 2 studies on any area of emergency medicine relevant to the professional practice. So basically it’s a modular MSc which you can exit early if need be with either a PgDip or PgCert. The course is organised into modules and you can choose a range of modules to build a course that is relevant and important to you. There are some resrtictions on that as some modules link together to form particular exit points. More details are available on the course handbook. We do have linkages that allow exit with sub qualifications in nursing, paeds EM, emergency management and emergency medicine. The modules are delivered online (using the St.Emlyn’s moodle platform) and learners are organised into groups who interact with each other and with the tutors. That’s fairly typical for Masters level learning, we don’t spoon feed you information, but look to you to find, evaluate, critique and create knowledge. This is about learning at the cutting edge of what we can find from the literature and clinical practice and not simply the regurgitation of what you can read in a book. At the end of the Masters then you are awarded one of the following final qualifications depending on which particular route you take through the various different module and in keeping with the final MSc project. What about the Masters project? This is a significant piece of project work examined by thesis. It usually takes about a year to complete. You work with a supervisor to complete a clinical project. Writing a thesis is tough work, but really rewarding. At this time we think that work on the MSc will help develop many of the skills required for the new Quality Improvement Projects for the FRCEM, although it’s early days with QIPs to know for sure. At the moment the MSc is open to Doctor and Nurses. As the course is online we welcome a range of students from the UK and abroad. Thus far we’ve not managed to develop a paramedic course, but there are plans. be working as either a registered medical practitioner or a registered nurse in an area of urgent or emergency care and may have an interview (usually by telephone or Skype). Students for whom English is a second language must hold IELTS (language test or equivalent). Students must also have achieved the Academic Standard at 7.0 or above. For Paediatric Medicine routes, students must be working in a paediatric ED. The PGCert Emergency Management has been developed for senior staff in emergency departments who may have completed their professional training and want a postgraduate qualification which reflects their management function. I could go on about this for hours as it’s a great project and one that’s been a real success for us and more importantly for our students (our 2017 intake is the biggest yet). If you’re interested then please in touch and talk to us. We’re keen to hear from anyone and everyone who wants to further their academic CV. Contact details below for the course, or pop your thoughts in the comments below and/or get in touch with the anyone on the St.Emlyn’s team who’ve been through the course. Any idea when/if they’re still developing the paramedic aspect to this course?